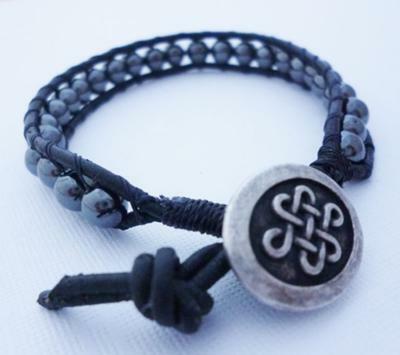 Love the pendant on this beaded leather wrap bracelet! 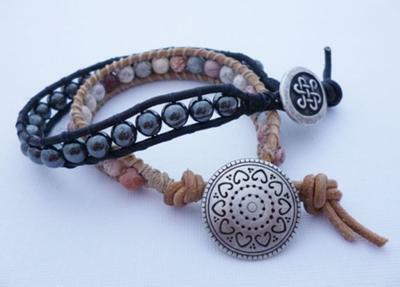 Description: Michelle creates these beaded leather wrap bracelets to sell and give as gifts. Such a cool design, right? After getting requests from from friends and clients, I started creating these popular beaded leather wrap bracelets - they're so fun and easy to make, too! The variations between beads and materials are almost endless and it prompted me to look for some other fun jewelry designs on line and that's how I found your site! I am excited to try out the "Friendship Necklaces" you have posted because they are so colorful and happy looking! 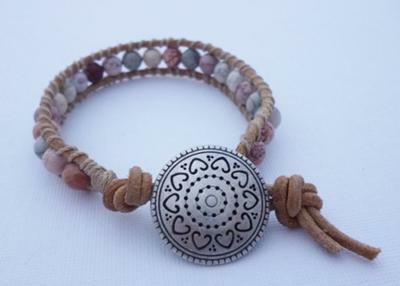 Does anyone know how to make this bracelet, or just triple the rows of a traditional beaded wrap bracelet shown here on How-to-Make-Jewelry.com? I know how to make single bead wrap bracelets, but do you know how to make double or side-by-side beaded bracelets? You can try www.crystaldreams.es as input on Youtube.com. Very nice innovations with beads I really liked the idea. Very nice designs and a good way to get them up and beautiful indeed. I have tried to make bracelets just like that. Great minds think alike. Anyway, I have tried to find a pattern or several patterns that I can incorporate leather and beads. Linda...if you enter into the search bar...how to make leather wrap bracelets...you will pull up a page that has lots of information and different videos where you can find out how to make these bracelets. I hope this helps you!